DACC recognizes and prioritizes the responsibility of protecting client data, staff, systems, facilities, and internal information. Security is a core focus for DACC and a foundational component of our operations. “Paranoia as policy” is embraced by our operating and technical teams. The operational nuances of an emerging industry, coupled with the risks facing all crypto asset holders, creates a complex threat landscape that cannot be sufficiently addressed with legacy defenses. DACC’s goal is to avoid mistakes and oversights and manage threats by starting with tangible risk management and a zero-trust approach. The cornerstone of this approach is DACC’s proprietary, off-chain, multi-signature cold storage of client private keys. All operations requiring access to a client private key, or similarly sensitive systems or processes, are conducted within secure facilities that require staff members to authenticate their identities using a combination of biometric data, PIN codes, and proximity cards. Our facilities utilize closed circuit 24x7 video monitoring, have 24x7 armed security, and industry leading intrusion detection, fire suppression and environmental control systems. Access to client private keys can only be accomplished in restricted areas by authorized staff members that require additional authentication protocols. In addition to these enhanced protocols, restricted areas are “air-gapped”, meaning they have no network access – including and most especially internet access – and have specialized shielding to limit threats anticipated by sophisticated adversaries. This environemnt is consistent with what is required by Intelligence Community Directive (ICD) 705, Sensitive Compartmented Information Facilities (SCIF) – Physical and Technical Security Requirements. 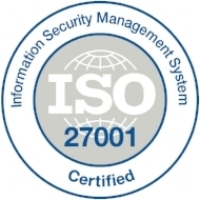 Our operations facilities are audited by third parties and have received SOC 1 Type 2, SOC 2 Type 2, and ISO 27001 certifications. Adam has over 15 years of cyber security experience working in numerous regulated industries. This experience includes numerous roles within the US Intelligence Community and Department of Defense with several postings overseas. Additionally, Adam led cyber security engineering teams at Palantir Technologies, was a member of Microsoft’s National Security Group, and was an active duty US Marine. Adam holds several industry certifications.